You'll find that starting with a Recipe will give you a big jump-start on creating your custom GUI. Copy and paste one of these Recipes and modify it to match your requirements. Study them to get an idea of what design patterns to follow. If you like this Cookbook, then you'll LOVE the 100+ sample programs that are just like these. 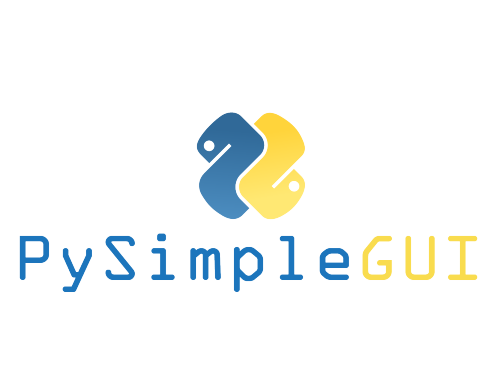 You'll find them in the GitHub at http://www.PySimpleGUI.com. These Recipes are simply several of those programs displayed in document format. You'll find a few of these Recipes are running in your browser window using PySimpleGUIWeb. They are included so that you can immediately play around with the SDK before installing one of the PySimpleGUI variants on your computer. 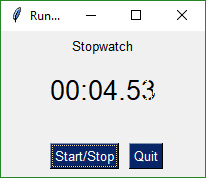 This is a new capability for PySimpleGUI that has only very recently been started. Only a few of the elements are operational using PySimpleGUIWeb. So, be prepared for some bugs. It's got a ways to go, but still seemed valuable to include. The one-shot window is one that pops up, collects some data, and then disappears. It is more or less a 'form'. The "Persistent" window is one that sticks around. With these programs, you loop, reading and processing "events" such as button clicks. This will be the most common pattern you'll follow if you are not using an "event loop" (not reading the window multiple times). The window is read and then closes. Because no "keys" were specified in the window layout, the return values will be a list of values. If a key is present, then the values are a dictionary. See the main readme document or further down in this document for more on these 2 ways of reading window values. Some of the more advanced programs operate with the window remaining visible on the screen. Input values are collected, but rather than closing the window, it is kept visible acting as a way to both output information to the user and gather input data. 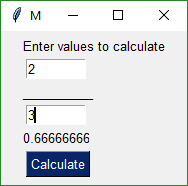 This code will present a window and will print values until the user clicks the exit button or closes window using an X. Note the do_not_clear parameter that is described in the next design pattern. This is a slightly more complex, but maybe more realistic version that reads input from the user and displays that input as text in the window. Your program is likely to be doing both of those activities so this will give you a big jump-start. Do not worry yet what all of these statements mean. Just copy it so you can begin to play with it, make some changes. Experiment to see how thing work. A final note... the parameter do_not_clear in the input call determines the action of the input field after a button event. If this value is True, the input value remains visible following button clicks. If False, then the input field is CLEARED of whatever was input. If you are building a "Form" type of window with data entry, you likely want False, the default setting (you can remove the parameter completely). Same GUI screen except the return values are in a list instead of a dictionary and doesn't have initial values. A simple GUI with default values. Results returned in a dictionary. Quickly add a GUI allowing the user to browse for a filename if a filename is not supplied on the command line using this 1-line GUI. It's the best of both worlds. Browse to get 2 file names that can be then compared. 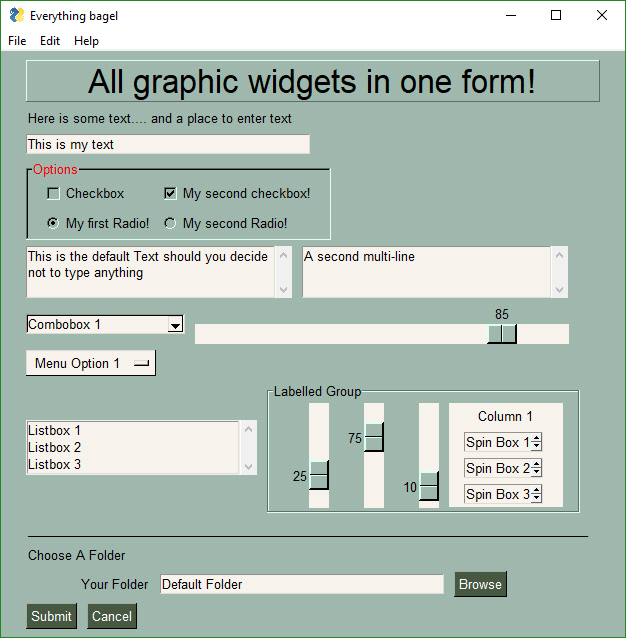 Example of nearly all of the widgets in a single window. Uses a customized color scheme. An async Window that has a event read loop. A Text Element is updated periodically with a running timer. Note that value is checked for None which indicates the window was closed using X. Use caution when using windows with a timeout. You should rarely need to use a timeout=0, non-blocking call, so try not to abuse this design pattern. The architecture of some programs works better with button callbacks instead of handling in-line. While button callbacks are part of the PySimpleGUI implementation, they are not directly exposed to the caller. The way to get the same result as callbacks is to simulate them with a recipe like this one. # tkinter callbacks. They are simply hidden from the user. 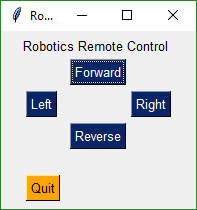 This recipe implements a remote control interface for a robot. There are 4 directions, forward, reverse, left, right. When a button is clicked, PySimpleGUI immediately returns button events for as long as the buttons is held down. When released, the button events stop. This is an async/non-blocking window. window.Close()   # Don't forget to close your window! This recipe shows just how easy it is to add a progress meter to your code. Buttons can have PNG of GIF images on them. 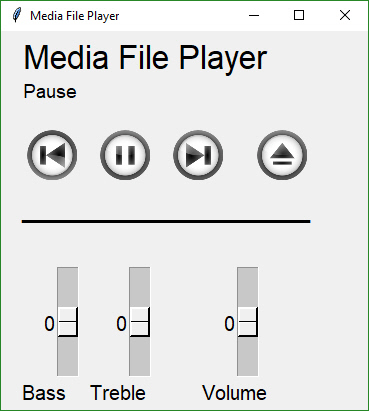 This Media Player recipe requires 4 images in order to function correctly. 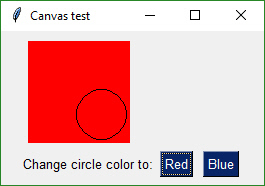 The background is set to the same color as the button background so that they blend together. This Window doesn't close after button clicks. To achieve this the buttons are specified as sg.Button instead of sg.Button. The exception to this is the EXIT button. Clicking it will close the window. This program will run commands and display the output in the scrollable window. Very simple script that will launch a program as a subprocess. Great for making a desktop launcher toolbar. CHROME = r"C:\Program Files (x86)\Google\Chrome\Application\chrome.exe"
A standard non-blocking GUI with lots of inputs. 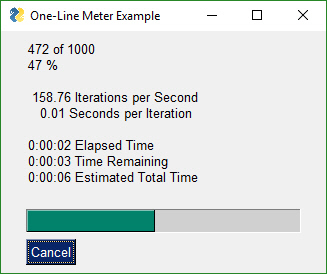 Perhaps you don't want all the statistics that the EasyProgressMeter provides and want to create your own progress bar. Use this recipe to do just that. 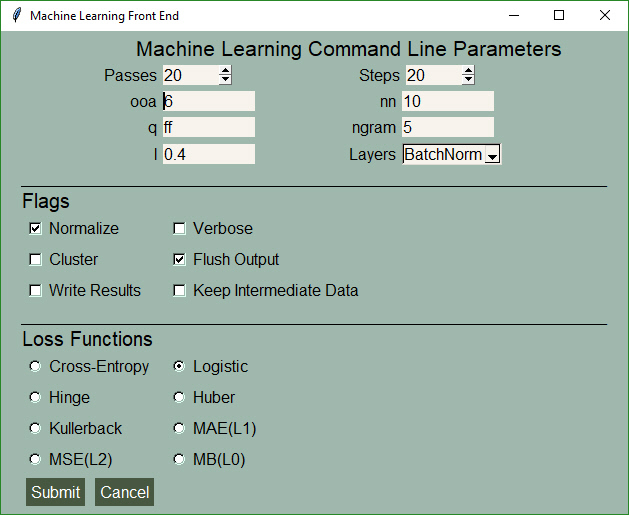 For those of you into super-compact code, a complete customized GUI can be specified, shown, and received the results using a single line of Python code. A Column is required when you have a tall element to the left of smaller elements. In this example, there is a Listbox on the left that is 3 rows high. To the right of it are 3 single rows of text and input. These 3 rows are in a Column Element. To make it easier to see the Column in the window, the Column background has been shaded blue. The code is wordier than normal due to the blue shading. Each element in the column needs to have the color set to match blue background. # Columns layouts look identical to GUI layouts, they are a list of lists of elements. This simple program keep a window open, taking input values until the user terminates the program using the "X" button. You can easily build "compound elements" in a single like of code. This recipe shows you how to add a numeric value onto a slider. 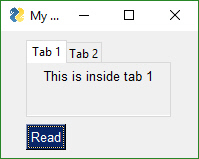 This recipe is a design pattern for multiple windows where the first window is not active while the second window is showing. The first window is hidden to discourage continued interaction. PySimpleGUI The Complete Course Lesson 7 - Multiple Windows"""
While it's fun to scribble on a Canvas Widget, try Graph Element makes it a downright pleasant experience. You do not have to worry about the tkinter coordinate system and can instead work in your own coordinate system. Just like you can draw on a tkinter widget, you can also draw on a Graph Element. Graph Elements are easier on the programmer as you get to work in your own coordinate system. This Recipe implements a Raspberry Pi touchscreen based keypad entry. 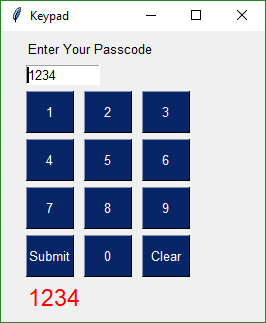 As the digits are entered using the buttons, the Input Element above it is updated with the input digits. Use the Canvas Element to create an animated graph. The code is a bit tricky to follow, but if you know Matplotlib then this recipe shouldn't be too difficult to copy and modify. Saw this example layout written in tkinter and liked it so much I duplicated the interface. It's "tight", clean, and has a nice dark look and feel. This Recipe also contains code that implements the button interactions so that you'll have a template to build from. In other GUI frameworks this program would be most likely "event driven" with callback functions being used to communicate button events. The "event loop" would be handled by the GUI engine. If code already existed that used a call-back mechanism, the loop in the example code below could simply call these callback functions directly based on the button text it receives in the window.Read call. Demonstrates using a "tight" layout with a Dark theme. You get 2 scripts in one. Use the upper half to generate your hash code. Then paste it into the code in the lower half. Copy and paste lower 1/2 into your code to get password protection for your script without putting the password into your source code. 5. Run program again and test your login! At the moment I'm using the technique that involves wscript and a script named RunNHide.vbs. They are working beautifully. 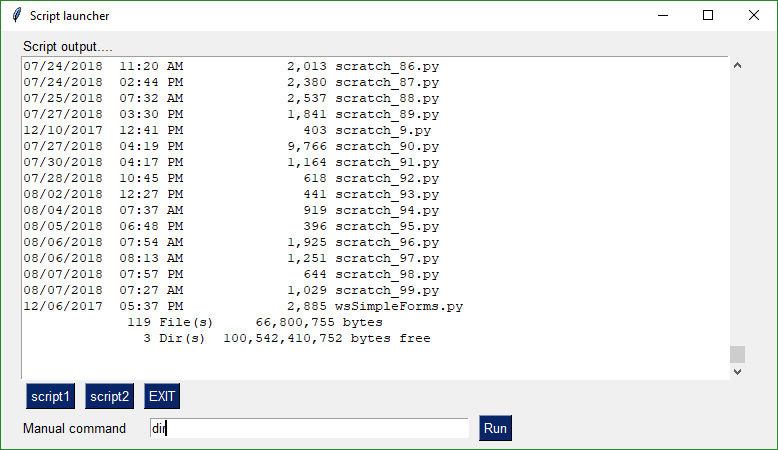 I'm using a hotkey program and launch by using this script with the command "python.exe insert_program_here.py". I guess the next widget should be one that shows all the programs launched this way so you can kill any bad ones. If you don't properly catch the exit button on your window then your while loop is going to keep on working while your window is no longer there so be careful in your code to always have exit explicitly handled. Impress your friends at what a tool-wizard you are by popping a custom toolbar that you keep in the corner of your screen. It stays on top of all your other windows. You can easily change colors to match your background by changing a couple of parameters in the code. You can setup a specific program to launch when a button is clicked, or use the Combobox to select a .py file found in the root folder, and run that file.  """ Much of the code is handling the button states in a fancy way. It could be much simpler if you don't change the button text based on state. NOTE - you will get a warning message printed when you exit using exit button. It will look something like: invalid command name \"1616802625480StopMove\"
Like the Timer widget above, this script can be kept running. You will need the package psutil installed in order to run this Recipe. The spinner changes the number of seconds between reads. Note that you will get an error message printed when exiting because the window does not have have a titlebar. It's a known problem. # Broke out of main loop. Close the window. Menus are nothing more than buttons that live in a menu-bar. When you click on a menu item, you get back a "button" with that menu item's text, just as you would had that text been on a button. Menu's are defined separately from the GUI window. 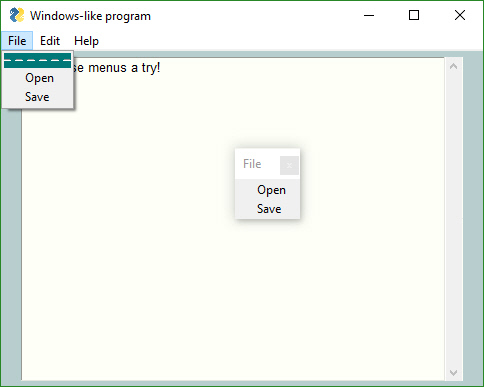 To add one to your window, simply insert sg.Menu(menu_layout). The menu definition is a list of menu choices and submenus. They are a list of lists. Copy the Recipe and play with it. You'll eventually get when you're looking for. 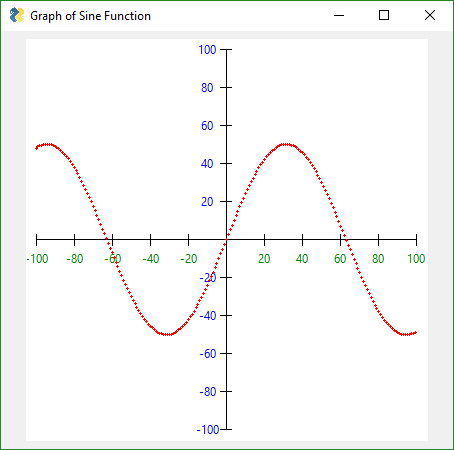 Use the Graph Element to draw points, lines, circles, rectangles using your coordinate systems rather than the underlying graphics coordinates. In this example we're defining our graph to be from -100, -100 to +100,+100. That means that zero is in the middle of the drawing. You define this graph description in your call to Graph. Tabs bring not only an extra level of sophistication to your window layout, they give you extra room to add more elements. Tabs are one of the 3 container Elements, Elements that hold or contain other Elements. The other two are the Column and Frame Elements. if event is None:           # always,  always give a way out! It's possible to create a single .EXE file that can be distributed to Windows users. There is no requirement to install the Python interpreter on the PC you wish to run it on. Everything it needs is in the one EXE file, assuming you're running a somewhat up to date version of Windows. You will be left with a single file, my_program.exe, located in a folder named dist under the folder where you executed the pyinstaller command. That's all... Run your my_program.exe file on the Windows machine of your choosing. Your EXE file should run without creating a "shell window". Only the GUI window should show up on your taskbar.